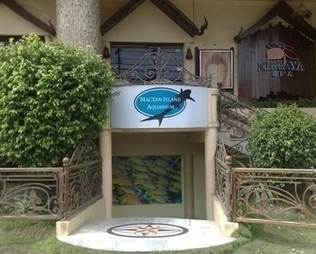 Mactan Island Aquarium is the newest visitor attraction in Cebu Philippines. It features a collection of aquarium exhibits that takes visitors on an underwater tour through the seas and rivers of the Philippines. On arrival at the underground level of the landmark building in Barangay Basak, visitors are guided by Marine Biologists that work at Mactan Island Aquarium, introducing them to the different animals such as Seahorses, and Sharks and explaining how they live in the wild. A full guided tour is included in the admission fee and there is a strict no tipping policy. There is a strong education and conservation message too; the aquarium guides also inform of the threats and problems faced by the Philippines underwater ecosystems such as dynamite fishing and pollution and what we can all do about it. There are further plans for a captive breeding project for seahorses and clownfish. Officials from Cebu Bureau of Fisheries and Aquatic Resources (BFAR) have already indicated their support for the project as it will be beneficial in spreading a conservation message. During your tour you can expect to see creatures such as deadly octopus, beautiful angelfish, cowfish (with horns) and you also have the opportunity to learn how to pick up a crab without getting hurt, or to touch starfish and other creatures with the help of the guides. The owners and creators of Mactan Island Aquarium are British Marine Biologist Dylan Taylor and his Filipina wife Lucille. The couple has worked together on large aquarium projects across the world including the National Aquarium in England, the aquariums at the worlds only seven star hotel, the Burj Al Arab in Dubai and in Saudi Arabia where the work included installing aquariums for the Saudi royal family. With over 12 years professional aquarium experience, the owner is bringing all of his knowledge and abilities in aquarium exhibit technology and water filtration systems to the project. As the aquarium is not right next to the beach, seawater is collected from the ocean and transported to the site regularly. At the aquarium the life support systems for the fish are kept running 24 hours a day to keep the water clean enough for the inhabitants. The water is analysed in a laboratory at the aquarium, to make sure that it is safe for the sensitive creatures. The animals also require special diets to keep them in good condition and medical care to prevent sickness or diseases and to aid their recovery if they should become sick. The owner was already very familiar with the fish of the Philippines, because having worked in aquariums in Europe; he learnt that aquarium fish imported into Europe, Japan and the USA are mostly from the Philippines. So, during visits to the Philippines with his wife, he was surprised that there were no aquarium attractions such as the oceanariums seen in Hong Kong and Singapore and planned to build one some day. The central Philippines is considered by scientists to be the Global Centre of Marine Biodiversity – meaning there is no other place on earth with such a rich variety of life. The fact that the Philippines gained an unfortunate reputation for destructive fishing using cyanide and dynamite seemed like a further reason to build an aquarium, to act as a focus point, so that local people would know more about the amazing marine life and ecosystem here, and so be more motivated to protect it from damage. >Mactan Island Aquarium has been priced to be affordable to local people and kids to visit, not just tourists, as it is in the hands of the locals to ultimately conserve the Sea Life of the area. Knowing that scuba diving, or a trip to Manila or Hong Kong are out of reach of many peoples finances, now there is a place to see the underwater life without costing too much. Many resorts and local communities have established marine sanctuaries to encourage ecosystem recovery for diving tourism and sustainable fishing in the Visayas area. This was another part of the decision to locate the aquarium in Cebu. Mactan Island Aquarium aims to promote and work along with the operators of the marine sanctuaries to keep raising awareness that the marine ecosystems of the Philippines are worth more alive than they are dead.